And so, after a “Monster-of-the-week” second movie, the mythology of The X-Files continues once more after eleven years of absence — more than the length of the series itself! With creative input for the framing of the story and perhaps little more from Chris Carter, who comes out from XF retirement for the occasion, long-time XF fan Joe Harris is the writer. This is a new situation, where the creator teams with a fan to conceive the next steps in the story begun in 1993, in what is described as a fully canon continuation of the story. 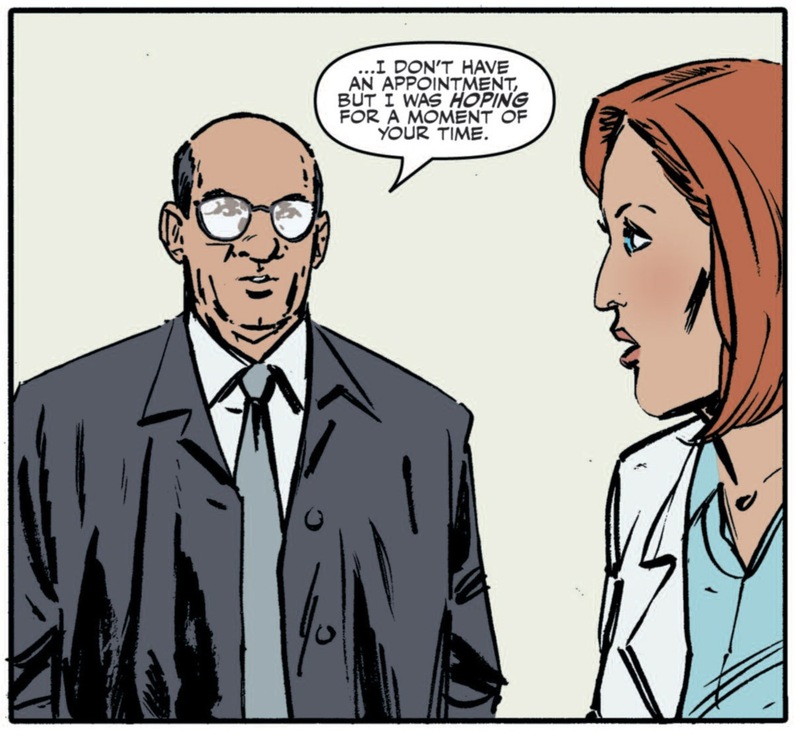 The X-Files are not new to comics. XF comics started appearing as early as 1995, with the first issues (writer Stefan Petrucha / artist Charles Adlard / covers Miran Kim) proving to be the best of them. The relationship of the comic creators with the all-controlling Ten Thirteen Productions was not an easy one though, perhaps because Carter was not a comics man himself (as per Frank Spotnitz), and the comics stopped in 1998. There was a revival led by Frank Spotnitz around the hype of I Want To Believe in 2008, which was the closest thing XF got to a reboot separate from its main continuity; and a year later a cross-over (with horror series 30 Days of Night), which is another route franchises take when the main story has been told and characters have become part of popular culture. “The X-Files Season 10” is wholly new in the storytelling direction the comics take, and in the interest the creator (Carter) shows to them. Important to note too that issues #1-5 “10X01: Believers” was already drafted by Harris when Carter joined the team for course-correction and advice. Not being a supporter of the marketing-friendly idea that ‘the writers could continue the stories of these characters forever’, my interest in a continuation of XF has remained because Carter keeps repeating there is one final chapter in the mythology he wants to tell. This interest has been scaled down by the irrevocable damage to the XF mythology that seasons 8 and 9 did and by a second movie that, though decent was far from perfect. I’ll follow Season 10 with a hope that it will add something to the mythology in continuity with what has come before and with a clear mindset of moving towards a conclusion of the story somewhere down the line. At this stage of Mulder & Scully’s characters and personal journey it’s difficult to imagine them investigating monster-of-the-week type cases and the most magical step would be to re-attempt what was done in seasons 8 & 9, i.e. introduce new characters perhaps coached by Mulder & Scully to take over these investigations. The IDW team and Joe Harris have treated the fans with a lot of respect up to now and teased all the upcoming issues in all the right ways invoking our feelings of nostalgia; it will be interesting to see whether this fan service will extend towards storytelling decisions that do disservice to the general picture (the promise of the return a certain deceased character in particular is already iffy). We will come to that in time. The season kicks off with a story split in five issues. It will be best to analyse the story when we will have the full story, but the discussions while the story is still developing brings us back to the time when the show was still on the air — which is exactly the point! A full review of the Believers arc will come with issue #5. 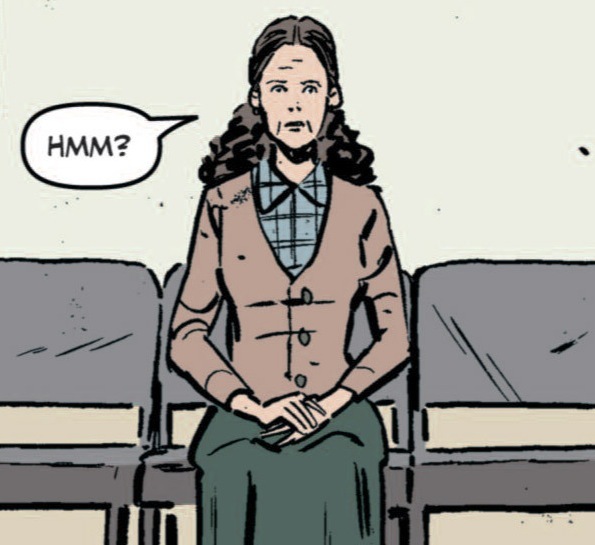 One comics issue at 22 pages is very short, however the writing is tight (whole comments on what happened before Season 10 and on what the characters are feeling right now could be made around individual panels, enhanced by Walsh’s art!) and launches us right in the thick of the action. If this were an episode, it would roughly correspond to a teaser + the first act out of four, so roughly 15 minutes which is roughly the time it take to read it. If this were an episode, the wait for the next one would last one week and not one month. These frustrating elements are inherent of the periodic comics world: it’s a different medium and we have to accept that patiently while the artists do their work. Another solution would have been to do a graphic novel (a series of them?) with more pages, more time to refine the artwork and more time between issues; but that is actually a much more rare form in comic books, in particular for licensed comic books from previously existing franchises. This is, after all, a profit-oriented enterprise. For patient X-philes/readers, you can discover the story in bulk when it gets collected, for example bundling every six issues (as with The Walking Dead, or with Joe Harris’ original series Great Pacific). On an entirely different style, mixed media, I would have loved to see Dave McKean do the X-Files. However, even if Michael Walsh’s art can still bear some improvement (certain perspectives, some details…), I find the overall esthetic with thick black lines and marked contrasts very well adapted to the X-Files — this is reminding me of the Adlard approach in early Topps comics. This “classic comics” approach sticks much better to the XF universe than a great share of modern comics that are post-processed a lot in terms of colouring/lighting on computer, or the semi-photorealistic approach of the 2008 Wildstorm comics. This “old-style” also fits well with the classic cinematic approach the X-Files had, breathing cinema into television in the 1990s. Walsh has acknowledged that he’s studying framing and camera shots from the show to inform his art, which is good. Apart from structure and characterization, there’s another thing that this comics gets perfectly: the modern, 21st century setting. XF used to include in its storytelling some commentary on current issues of its time, like growth hormones in beef, genetically modified crops, CCTV surveillance. Joe Harris promised that the X-Files would be propulsed to a whole new worlds of threats and conspiracies: increased surveillance since the 9/11 attacks and Patriot Act, widespread national security concerns with hackers and Anonymous and Wikileaks and Snowden, drone warfare, shifting geopolitics… The way Skinner talks about the breach in FBI security, and the way certain of these contemporary issues are also referred to in Joe Harris’ Great Pacific can only be good news for the future of XF! The issue makes a fine job of opening loads of questions for the rest of the story arc, and I guess for the rest of the Season. What has happened since 2008? (or 2002 even)? What happened with the colonization plans? I Want To Believe happened in early 2008 and we are told in interviews that this is unfolding in the present day (but is it June 2013? ), although this could possibly be prior to the announced colonization date December 22 2012. Perhaps the exact setting will be revealed in future issues, and surely the status of the colonization and the Supersoldiers will be addressed. With 12 issues per year I don’t think things will occur in real time, rather what is meant by “present day” is a generic post-IWTB setting, and Season 10 will get “stuck” in 2012 or in 2013 or whenever we are. Mulder & Scully have entered an FBI witness protection program, for some reason and somehow. They go by Mr and Dr Blake and live in Spotsylvania, Virginia (a real location, as odd as it sounds! ), which is the same state they were living in I Want To Believe. Dr Blake is a gun-carrying pediatrician in a non-Catholic institution and Mr Blake is a shaved spooky neigbour. After 9X19/20: The Truth we were expecting them to be hiding undercover because they were being hunted by the alien Supersoldiers on the pretence that Mulder was still accused of murdering Knowle Rohrer; the Supersoldiers had full access to awesome internal and foreign security and surveillance systems. Then in I Want To Believe it turned out the FBI located them with no big trouble, perhaps indicating that the Supersoldiers hunt was off; with the casework in IWTB, all charges were dropped (officially at least) and all motivation to stay undercover went away. Why should they be under official witness protection is not explained (and I can see future issues staying silent on this matter). Has the FBI aligned against the forces under the Supersoldiers? Assistant Director Skinner has become FBI Deputy Director Walter S. Skinner, which was Kersh’s position in the last two seasons of XF. Although some reviewers have written that this story presents a random monster-of-the-week threat, this is definitely a mythology story — but only a real fan could tell from this issue! The mother who brings her daughter Emily to see Dr Blake/Scully is name Mrs Van de Kamp: the name of the couple who adopted baby William in 9X17: William. Mrs Van de Kamp doesn’t seem to listen to Scully as Scully gives her medical advice, and it is later revealed that she is among the hooded figures hunting Scully. The name is definitely not a coincidence. How did she get this close to Scully? Is she herself, is she in control of her actions or is she being manipulated (by Emily)? Is she even the original Mrs Van de Kamp or has she been replaced by an alient replicant (Supersoldier)? Which begs the question: Where is William? If this is indeed 2013, William must be about 12 — which is about Emily’s age. Some readers saw William in the ginger boy who plays baseball, but I don’t see what he would be doing in the same neigbourhood as the Blakes unless he’s there on purpose which sounds far-fetched. If Emily is with Mrs Van de Kamp, where is William? Could Emily, who we see change shape, be actually William? From the opening credits of season 9 we always expected William to develop some special powers, possibly psychic powers like the ones we see used by the hooded figures here. Did William realise his potential and got away from the Van de Kamps, forcing the aliens to start a search for him by impersonating the Van de Kamps? These hooded figures, who we know from next issues’ synopses are called The Acolytes, are able to exert mind control and mind-reading, and (at times) have glowing eyes. Mind reading at least we have seen as something the alien Colonists are capable of, as well as some advanced alien/human hybrids. The Acolytes are the ones who hacked the FBI, seeking information on the X-Files, then, having identified Scully was hiding as Dr. Blake, approached her via Mrs Van de Kamp and Emily, then had Skinner and Mulder be occupied so as to make their move on Scully. Are they a form of alien Supersoldiers? Another group of aliens? A human cult (like in 9X11: Providence) with special abilities? A group of “Supersoldier babies” we know was born around 2001 that grew fast? Or could they be themselves under mind control? Emily is certainly the most puzzling character. She seemed to be a minor character when our focus was on Mrs Van de Kamp, but she proves to be closely associated with the Acolytes when she shoots Scully, apparently helping the Acolytes capture her; but when they do she apparently drives them away or eliminates them with a flash of light. Is she on the Acolytes’ side, an enemy to Scully? Or was she working undercover with the Acolytes for her own ends? Was she controlling the minds of the Acolytes? The choice of the name Emily, the name of Scully’s biological child now deceased, points to the fact that “they” know a lot about Scully. 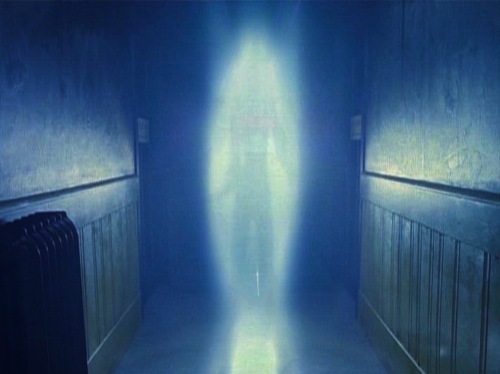 A character emitting a flash of light to neutralize its opponents was seen in Black Oil-infected characters (like in 3X15: Piper Maru): was she carrying the Black Oil? (and if that’s what happened, how did Scully not get radiation?) We see her change shape and grow to an adult human, something we’ve seen many times before in the XF mythology: is she an alien/human hybrid or a shapeshifting Rebel alien? 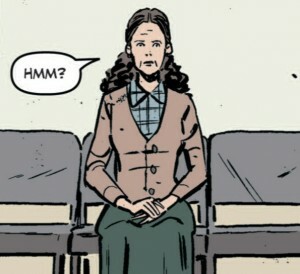 From what we know of the next issues, the character she morphs into, The Deacon, will play a central role in the story. Could the Deacon be William? Why is Scully the target? Will the Deacon use Scully as a hostage to force a William in hiding to reveal himself? Is Scully (and/or William) a means to get to another goal entirely? And why now? A Village of the Damned-like (or 4X01: Herrenvolk-like) generation of abnormal children could be a starting point for the intrigue, thereby tying in with 12+ year old William. An underground league of resistance (like the hybrid clones in 4X15: Memento Mori…or the aforementioned children, there’s a plot twist!) that Mulder and Scully would stumble upon would provide the “broad impact manpower” necessary to provide a solution to a global invasion scenario, a solution which would most likely have to be biological and not military in order to respect the plausible realism explained above. It’s now an established fact that both Joe Harris and Michael Walsh are XF fans, and there are plenty of elements that they have introduced here to make Season 10 coherent with the story, the characters and the aesthetic, as well as little Easter eggs that only fans will appreciate better. As this is the first issue, there are plenty! Scully is a practicing doctor in medicine in a clinic, all dressed in white, just as we saw her in I Want To Believe. The child she sees to is called Emily, like her biological daughter in 5X07: Emily. Scully taking care of children is also something we saw frequently (5X20: The End, I Want To Believe). Scully wears her cross we have seen since as early as 1X02: Squeeze. Skinner “calls her into action” in a very similar way as Agent Drummy did in the beginning of I Want To Believe. The kids outside the Blakes’ suburban house play baseball, which is all very Americana, but it’s also Mulder’s favourite sport as we saw in 6X20: The Unnatural. The three kids also reminded me of the three kids in Fight The Future. Mulder is called, of course, “spooky”, the nickname he carries since the 1980s. Mulder explains in detail the source for Mulder & Scully’s aliases: “The Magician” by Bill Bixby, a TV show in 1973-1974 that Mulder (and Chris Carter!) watched as a kid — and was about to watch just when his sister was abducted, as we saw in 2X01: Little Green Men. Mulder’s “I Want To Believe” poster is of course still hanging on the wall, along with file cabinets, trophies, desktop lamp. Mulder uses an old typewriter for his memoir: could this be a reference to the Cigarette-Smoking Man’s (his father) habit? We saw this in 4X07: Musings of a Cigarette-Smoking Man and 5X14: Patient X.
Skinner’s rental car is a Ford Taurus and he stays at a roadside motel, both very frequent habits for Agents Mulder & Scully. 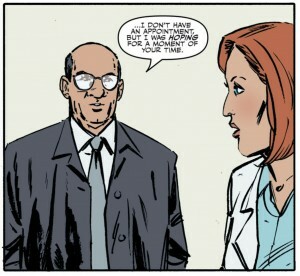 As in I Want To Believe, Scully uses a Blackberry, Skinner an iPhone, and Mulder doesn’t. Next issue: “Believers” 2 of 5, June 24 2013. This entry was posted on Tuesday, June 25th, 2013 at 7:14 pm	and is filed under Comics. You can follow any responses to this entry through the RSS 2.0 feed. You can leave a response, or trackback from your own site. Whaouou ! Quelle analyse ! J’apprécie vraiment la précision des références (graphiques, épisodes, etc…) et le tour très complet que tu as fait des questions qui se posent. Tu ouvres même des questions que j’avais zappé (la date de la colonisation par exemple). Vraiment, j’adore cet article ! Merci! Etant donné le temps que je passe déjà sur la version en anglais, je n’ai pas de traduction française non. Mais rendez-vous sur XFM pour en parler? Nice review! I especially enjoyed the easter eggs. A few of them I didn’t realize/remember until you pointed them out. Great job! I think the comic is off to a great start. Even though the comic format is new to me, I’m really enjoying the twists and turns thus far. Let’s hope the momentum continues! Can’t wait to read more. Nice job on the review :). Like the story so far. Not a huge fan of the retro artwork though. It’s ok and fits the story, but having the characters look too retro isn’t good either. Am looking forward to future issues though to see how the story line develops. Any comments on the fact that the blood Scully draws from “Emily” is red? Since we later find out that “Emily” is actually a shapeshifter alien, wouldn’t the blood be green and toxic?